All this week I have been sharing with you my wedding ideas. Did you miss any of the fun? Check out the wedding ideas from day 1, day 2, and day 3. 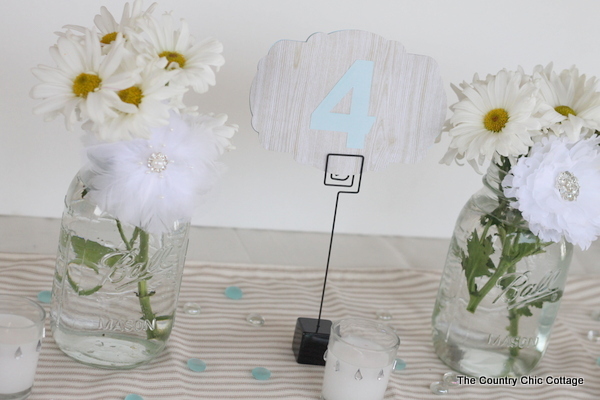 Today I am going to share with you how to pull some of the items I made together into some reception table decor. I have pulled from the David Tutera Bridal Collection for my inspiration for these tables. So full of bling yet I added some rustic touches. 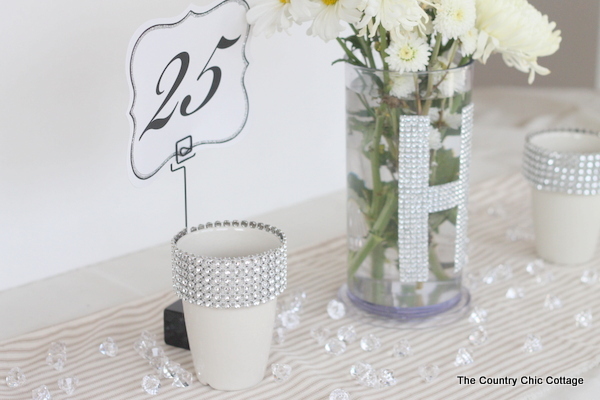 The bling candle holders, table numbers, and the vases all have tutorials so you can make your own elements. You can mix and match any way that you want with the elements. These are just the tables that I came up with when I started playing with the items I had made. The first table is my absolute favorite of the three. It is also probably the most rustic version so maybe that is not a surprise. I used a burlap table runner along with an old worn board. I added the shimmer of the painted mason jars, the metal blinged out candle holders, and of course the burlap table number. 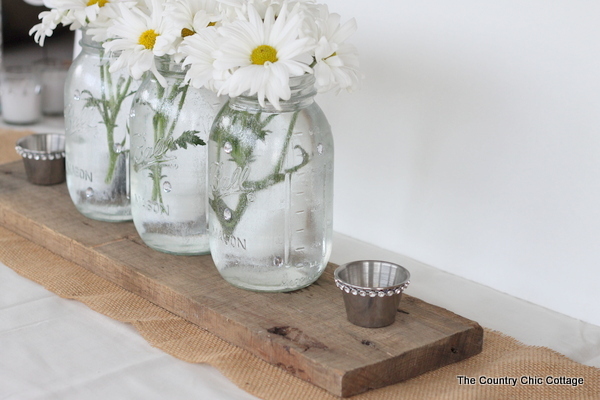 The flowers were cut very short to just grace the top of the mason jars. What a perfect wedding centerpiece this would be. 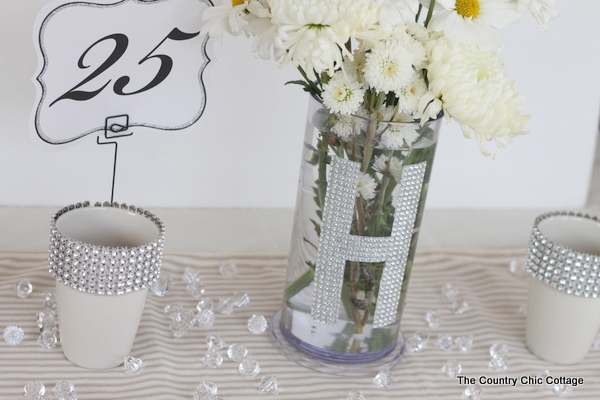 Find tutorials for the bling candle holders, table numbers, and the vases to complete your table. The next version brings in a touch of blue in the table number and also in the table scatter. The scatter is just a package of gems that you can find at most stores. They are generally used for vase filler so look in that section. The mason jar vases are adorned with what are actually hair pieces from the David Tutera collection. The bling on the candle holders is also from the collection. The table runner is plain ticking and I just tore it to size so it would still have a raw edge. 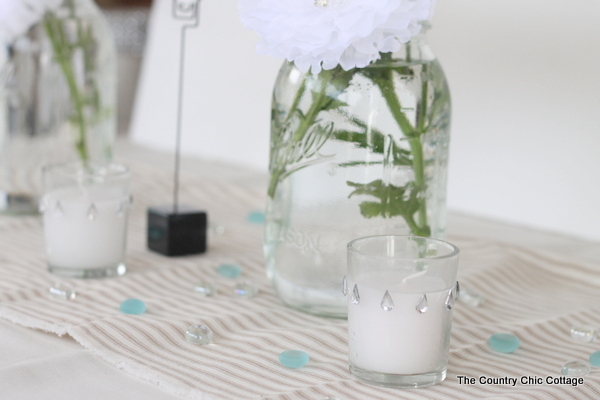 I love the bling elements with the mason jars and the ticking. They are like opposites that compliment one another. Adding bling does not have to be scary if done in the right way. Now maybe the above two tables are just not enough bling for your wedding. You REALLY want it to sparkle. I have a solution for you as well. Let’s get our bling on with this next table idea. Everything sparkles on this table from the vase to the candle holders. Even the table number has a touch of glitter. Then I bring it all home with some sparkly diamonds from the David Tutera Collection sprinkled all around the table. Make your wedding shine with this fun and easy table. 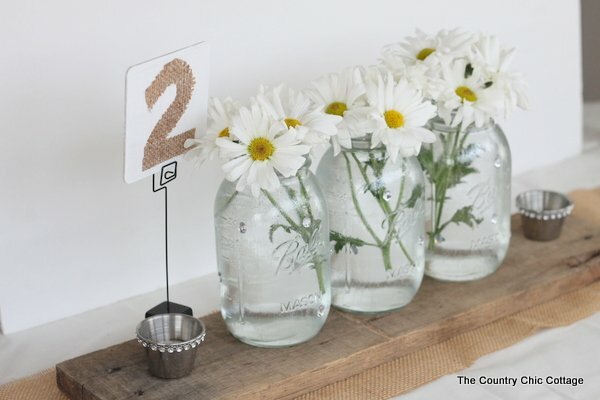 Be sure to subscribe to THE COUNTRY CHIC COTTAGE so you don’t miss any of our DIY Wedding Ideas this week. There will be two posts a day full of wedding ideas. You don’t want to miss these if you are planning a wedding! You can also find all of my past wedding ideas in my wedding project gallery. Wow Angie so many great ideas here! I love how you made the sheet of bling into a monogram…so clever! I love the mix of bling and rustic! They look fab! Very pretty… awesome use of bling!